Award Bedrooms and Kitchens is a family business spanning four generations in the wood working trade. 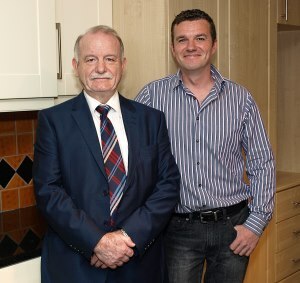 Since 1969, owner Declan Reamonn has been providing kitchen designs, building fitted kitchens and fitted wardrobes. Our wealth of experience and skill in wardrobe and kitchen design has, over the years, been handed on to his son, Barry, who now runs the company along with his sister Jennifer. We guarantee the highest standard of workmanship in the business. We don’t use sub-contractors. All our work is carried out directly by us so that you get the best possible personal service. Please take a moment to look at our Our Work and Customer Testimonials.